Home › Pix of the Trade › Avalon winner! 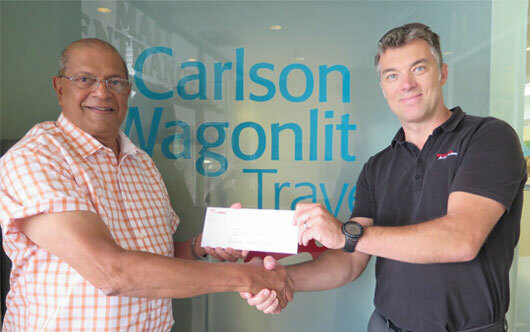 Hektor Kazuga (r), Globus family of brands’ BDM for Toronto and Halton Region, presents Zen De Souza of Carlson Wagonlit Travel in Toronto’s Humbertown Centre with a certificate as winner of an Avalon Waterways European river cruise for two. De Souza won the national contest for producing the highest sales of Avalon 2018 cruises during July. “We love Avalon for its reliability, value for money – and that there are never any issues once we book,” says De Souza. “Everything works like clockwork.” The winner of another Avalon cruise, who was drawn at random from all July bookings, is Julie Bekdashe of Paull Travel in Edmonton. The Summer Lovin’ contest, which sees two winners each month (one for top sales, one at random) runs through to the end of August.